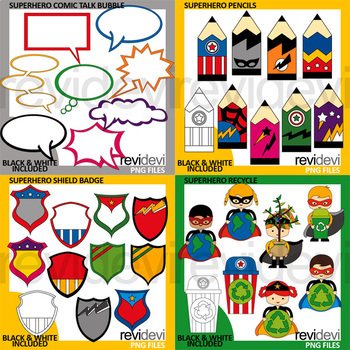 Superhero Clip Art in growing bundle. 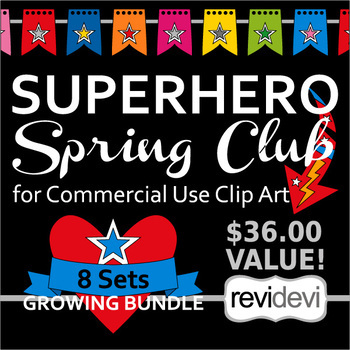 This bundle features various superhero theme clipart collection that you can get before Spring 2017 ends. Purchase this earlier at a lower price, and enjoy the full collection! Right now, I’m offering this membership club only for 20 usd. THIS WEEK ONLY! The price of this bundle will increase as new collections are added. You will have a chance to get new collection of REVIDEVI clip art for Spring 2017. All sets will be uploaded before spring ends. At an affordable price you will get lot of clip art! This is a super fun clip art collection growing bundle for teacher-author-seller. 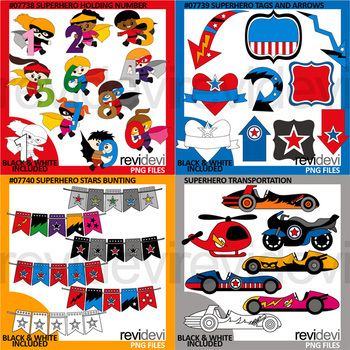 Clip art theme will be vary from tags/frames, kids/superheroes in activities, school related objects, and more fun superhero themes. They are perfect for creating TpT materials for Pre-K up to Elementary school grades. At total, you will get at least 8 sets. First week February 2017: 3 new sets are already there (inside zip folder) to enjoy. 07739 Superhero Tags and Arrows. It is also possible that I will upload the update earlier so you can enjoy the full collection sooner! Go to your "Purchases" menu on TpT and you will find that this product has a "Revised Version" notification. That means new sets are added! Just download from there, and you will get your new sets. You will always have access to all the sets, even after the day the first update posted. The clipart you receive in this growing bundle will be posted individually for around 4.5 usd in my store. Don’t miss out this opportunity to become a member. If you have any question, please ask prior to purchasing. Small business commercial license and non-profit/personal license included.